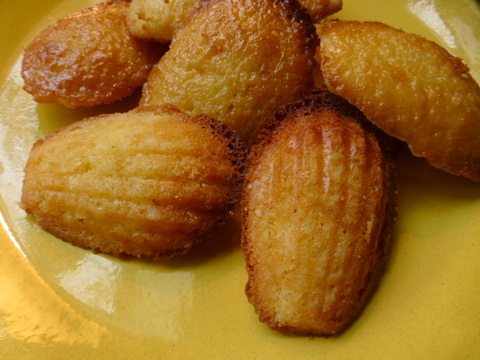 Madeleines are such fun to make. So much fun that after missing the first madeleine recipe with the first Tuesdays with Dorie group I bought the pan and looked forward eagerly to each and every Mad recipe. We made them several times and once again with Baking with Julia. No matter how often I make them it never gets old so I was happy to see them for this week’s Baking Chez Moi pick. These little sponge cakes had plenty of lemon zest and then to make them even lemony-er we dipped them in a lemon glaze and baked them another two minutes or so. Yes! Please! I think lemon is my favorite citrus to bake with. The taste is always fresh and summery. These were made a little differently from other Mads we had made. The batter was chilled. Then after filling the molds the batter was chilled again in the molds before baking in a hot (400 F) oven. The recipe says the batter will make 12 I actually came out with 17. I made a batch and made twelve from the batter but they overflowed the molds so I made another batch and made them smaller. While I didn’t get much of the characteristic hump they are still pretty and tasty. I glazed some and left some alone. Definitely something to make again and again. I mean, really, how can you NOT make those pretty little shell shaped sponge cakes?? You can visit with the other Doristas and drool over their madeleines by visiting the Tuesdays with Dorie website. the recipe is on page 212 of Dorie’s Baking Chex Moi. Buy the book. Join the fun!! These really are addictive, huh? We love these too! So good and could not stop at just one or two! I found these fun to make and delicious too! They look lovely! 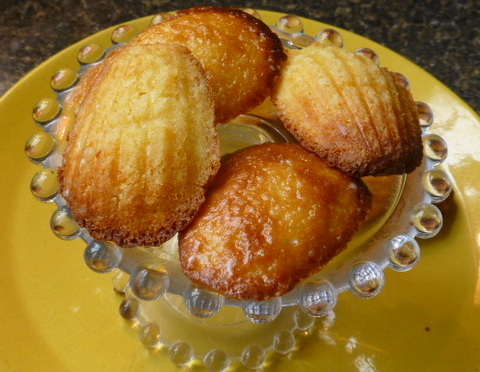 I really enjoy making madeleines as well and this was a particularly good recipe. I forgot about the Baking with Julia madeleines… This was one of the better mad. recipes that I have had – much moister than normal. They look wonderful. I never made the BWJ ones…maybe for a rewind week I’ll see what I think. They look really yummy, we enjoyed every bite. Your mads look great! And now I’m a madeleine convert too! I did not get the prominent hump either. Good thing it doesn’t change the taste! This was my first time making madeleines and they were so tasty. Good to hear that they stand the test of time since I invested in some pans too. I really liked the lemon flavor but I also made this with some of my white grapefruit and I’m really on the fence to which flavor I prefer. Yours look pretty tasty.